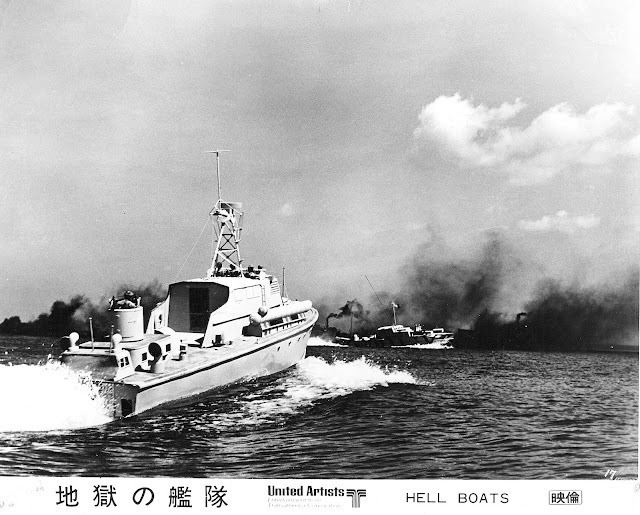 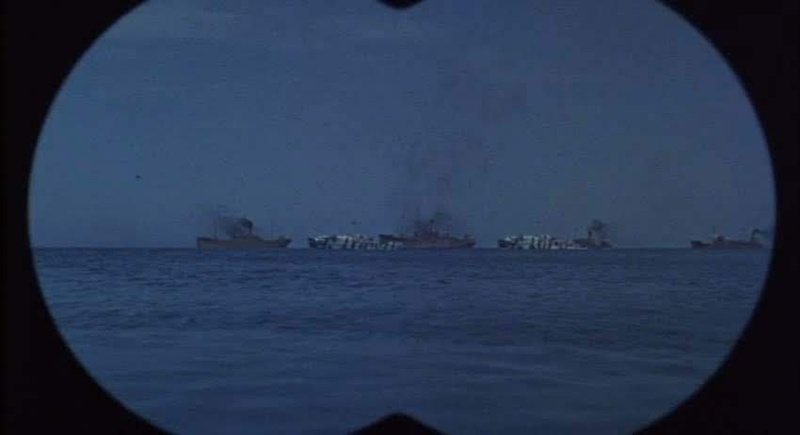 Hell Boats Japanese lobby card with the miniatures in action. 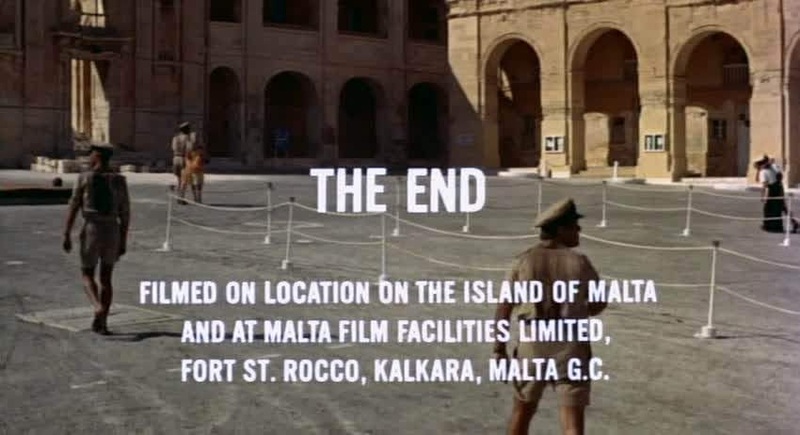 A film I had never heard of until suggested by a reader Simon. 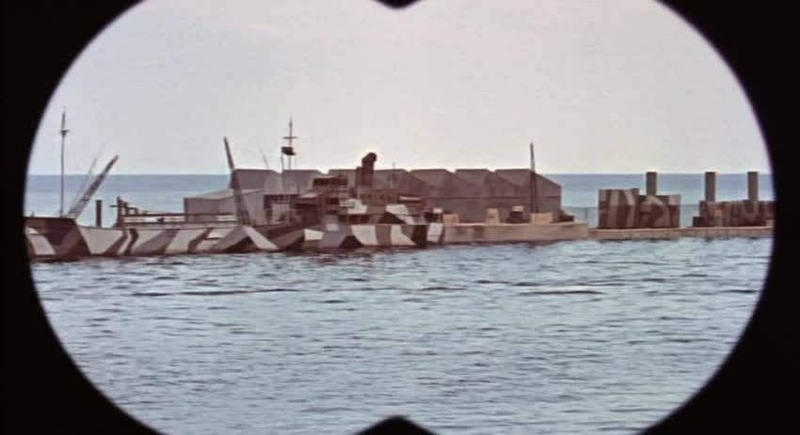 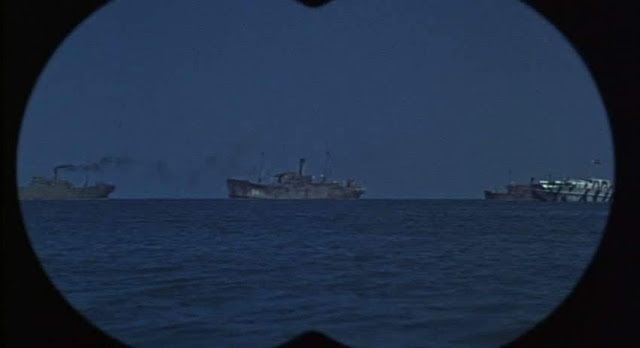 It has some pretty extensive miniature sequences concerning Motor Torpedo Boats, E boats and submarine pens housing glider bombs on Sicily during World War 2. 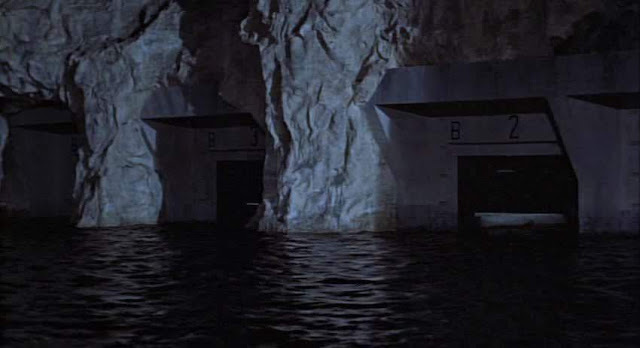 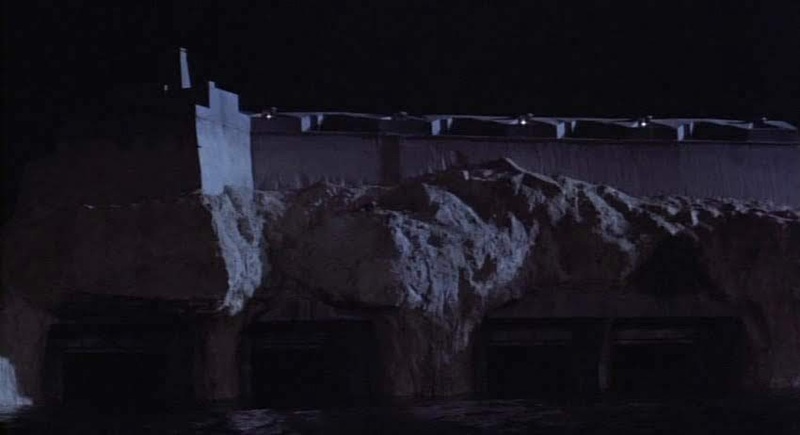 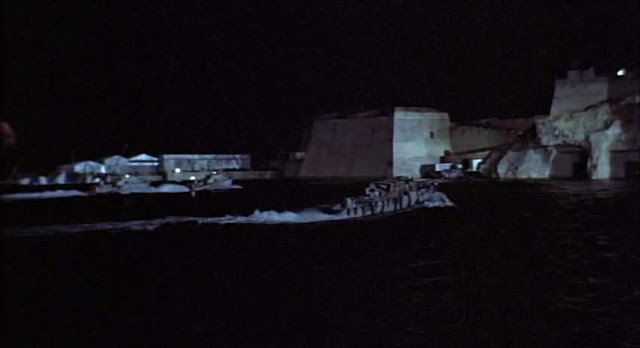 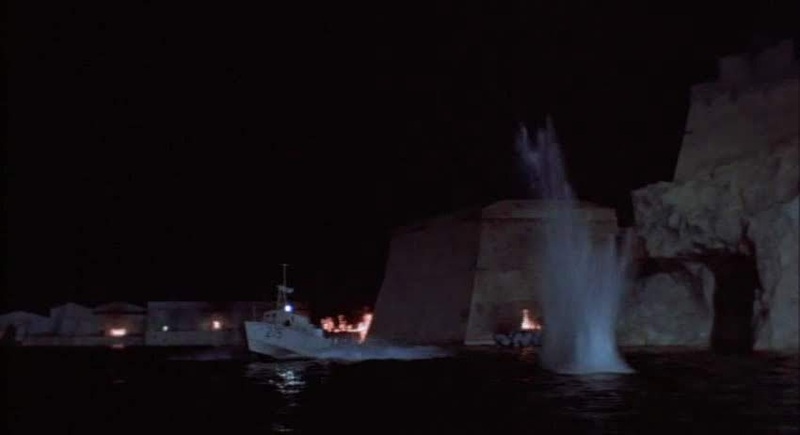 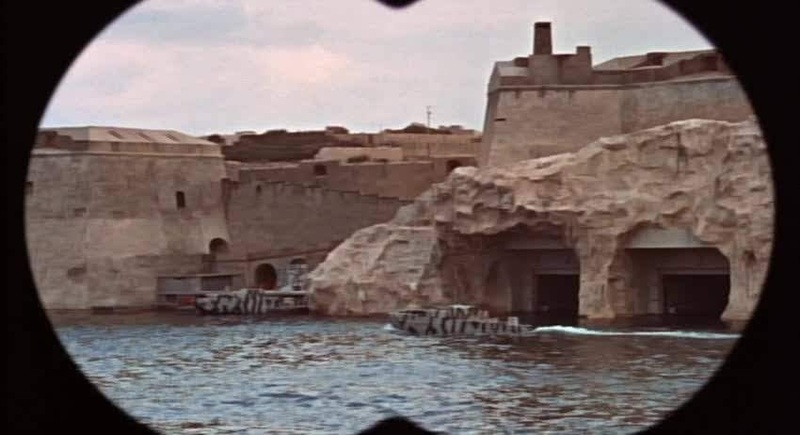 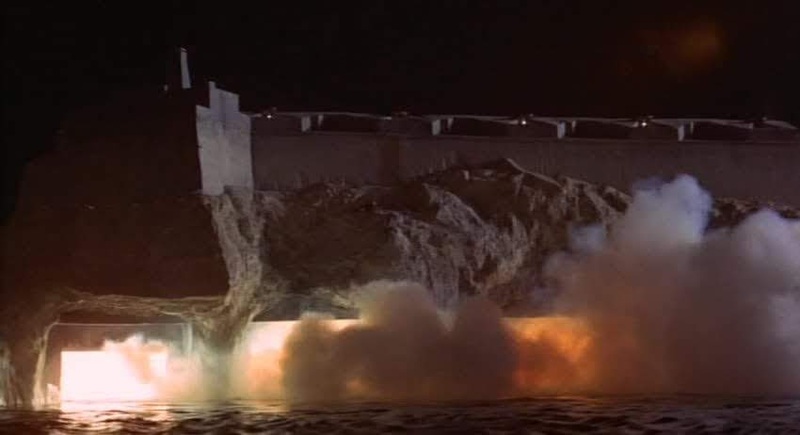 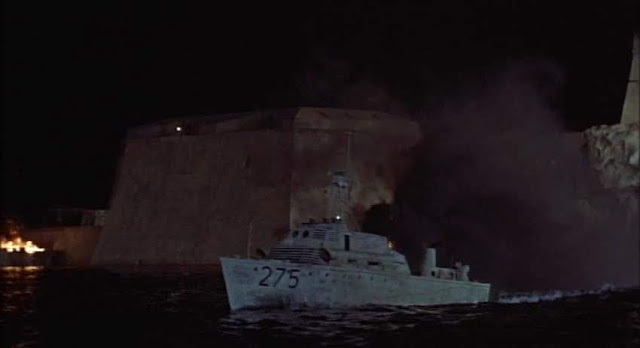 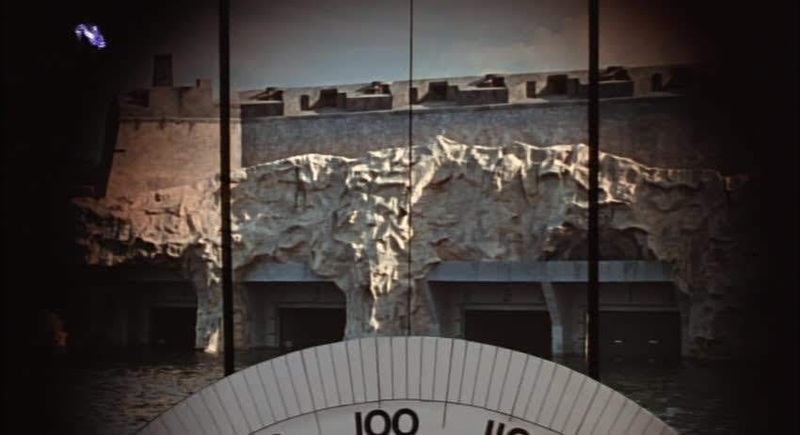 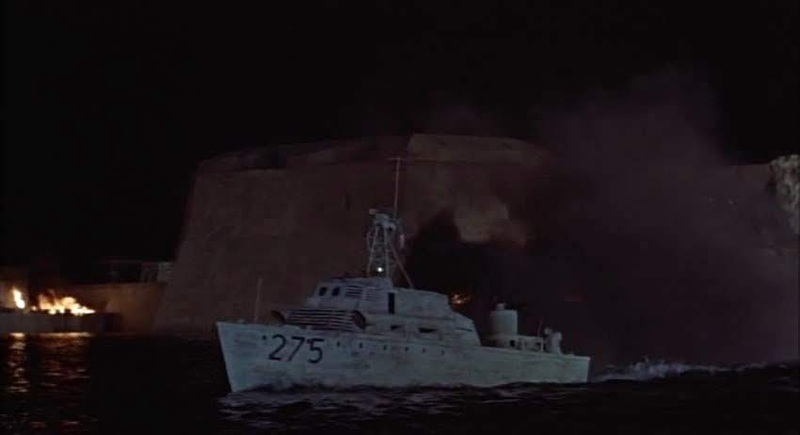 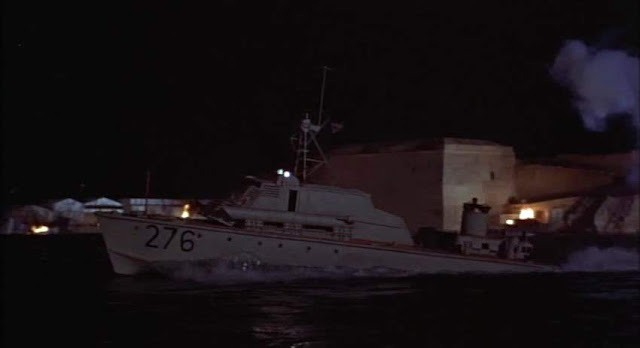 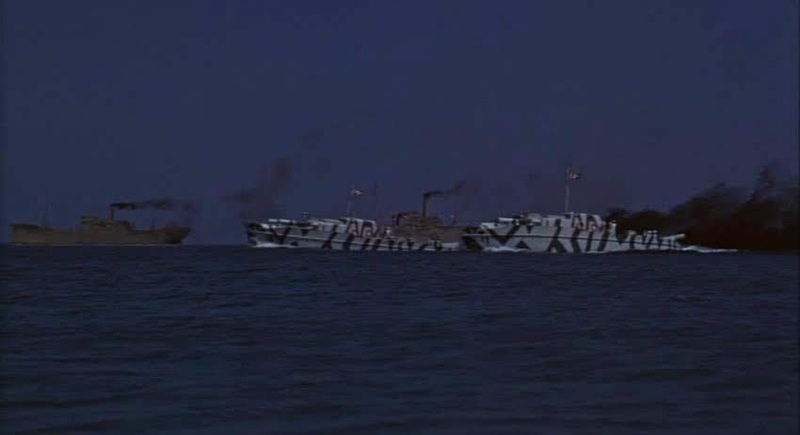 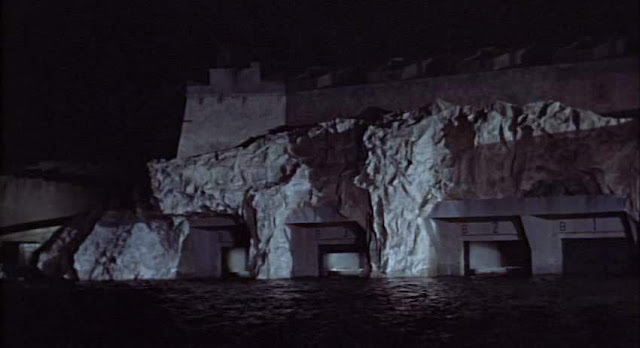 It was shot entirely on the Island of Malta, and I am guessing as was the miniature work. 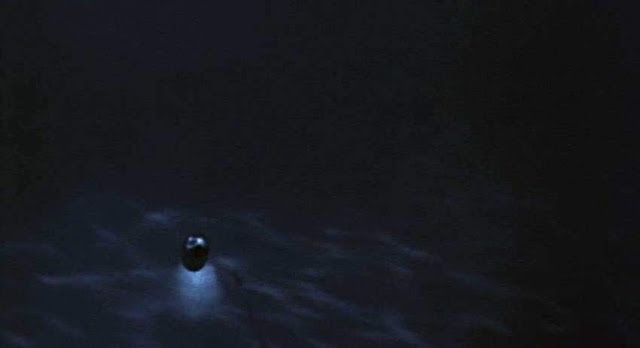 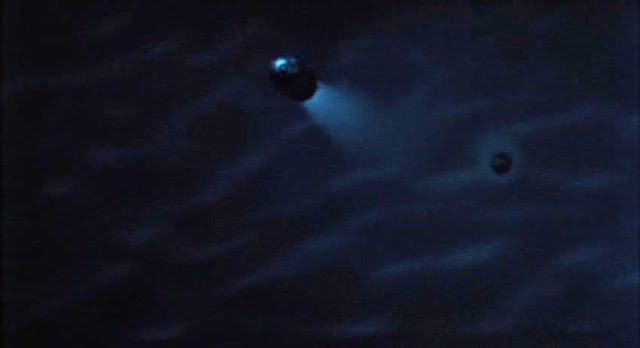 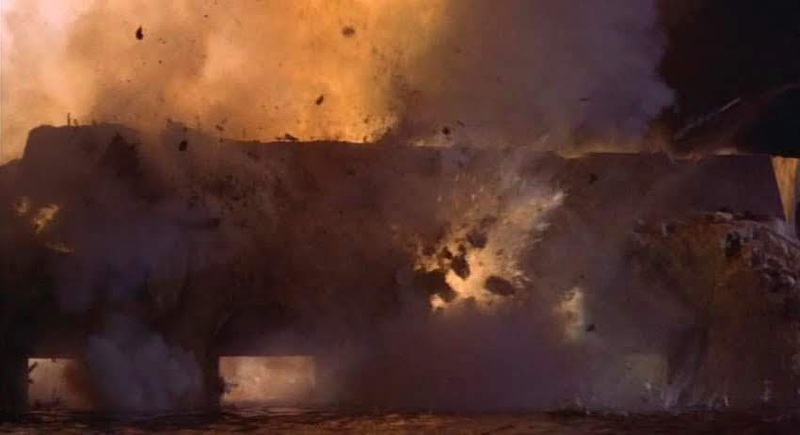 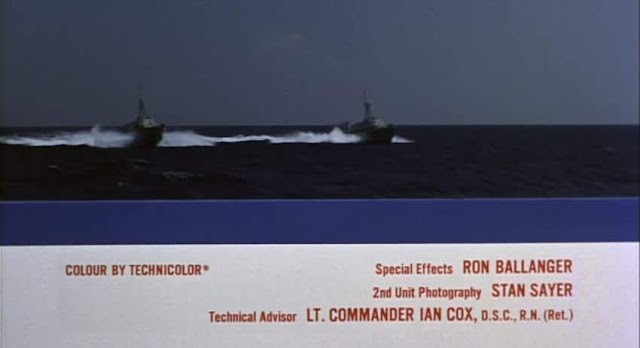 I can find no information about the miniature work which is not even credited in the film except for a special effects man which does not necessarily encompass the model work it usually means the live action bullet hits and explosives etc. 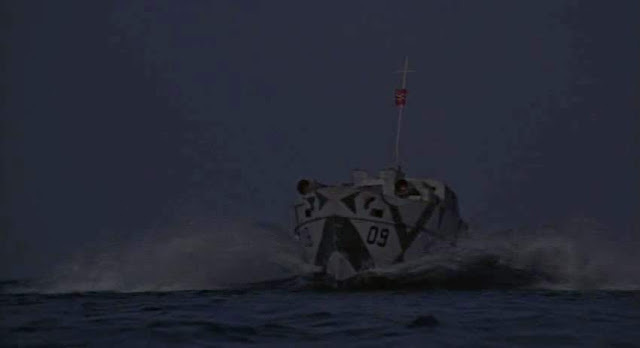 For the most part there is much creditable work on show, there are some great shots of the boats roaring about. 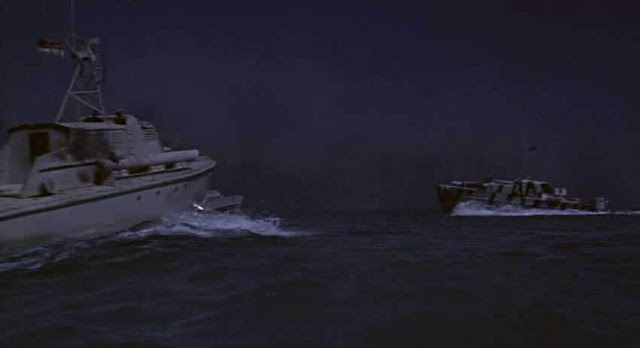 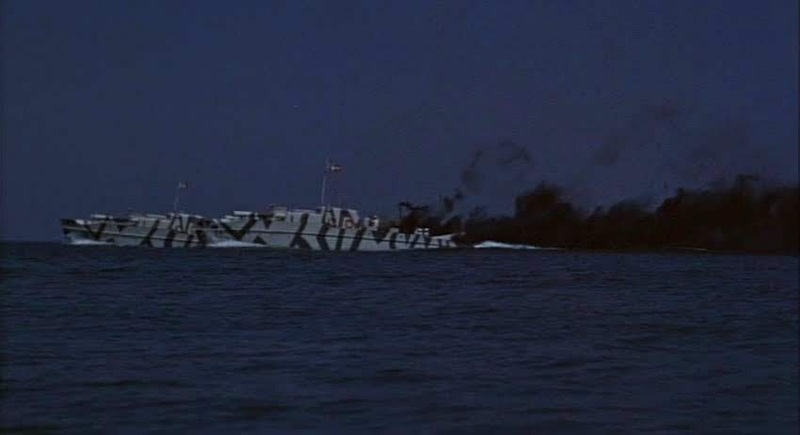 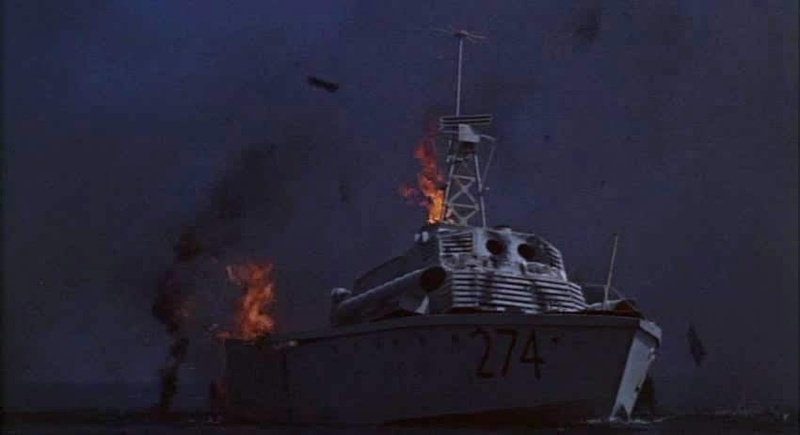 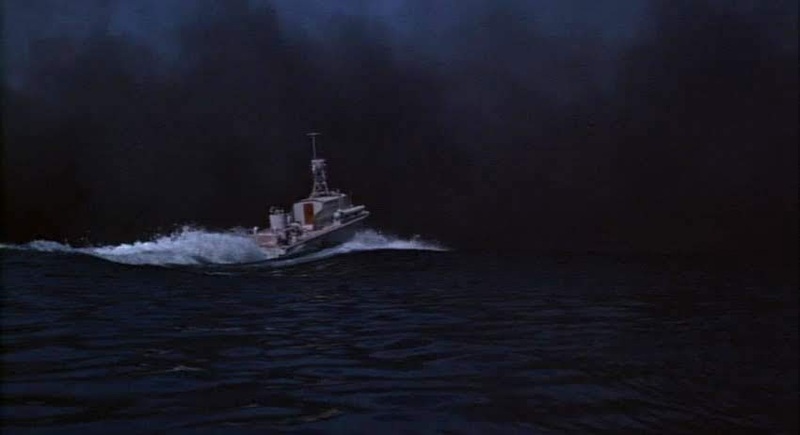 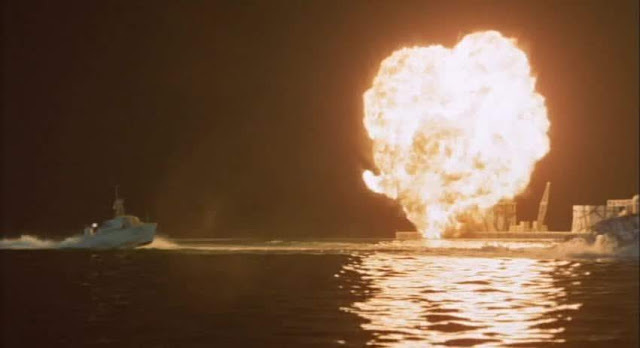 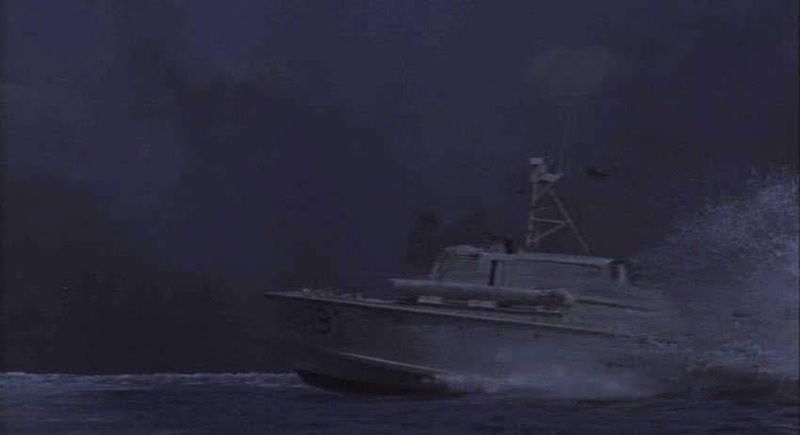 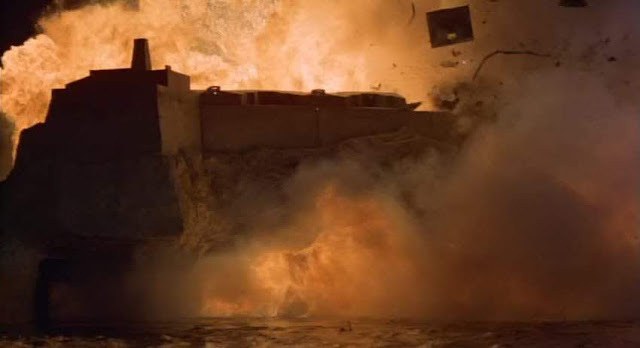 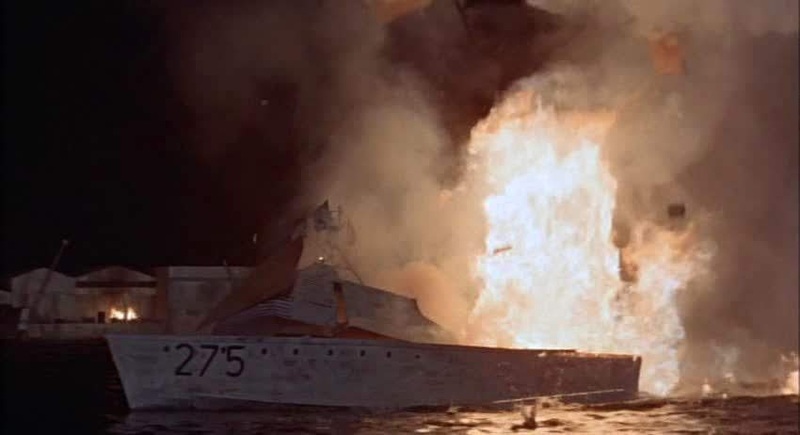 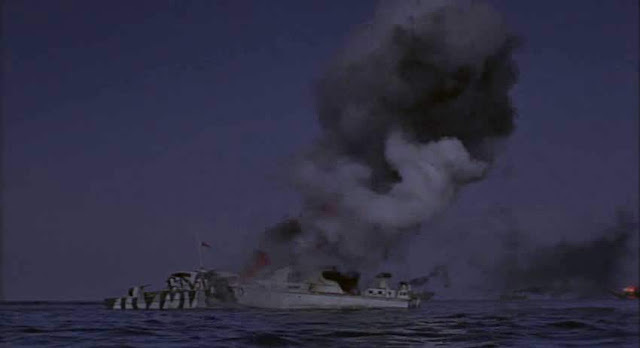 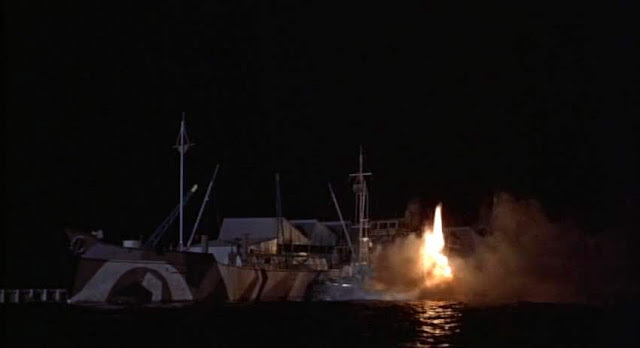 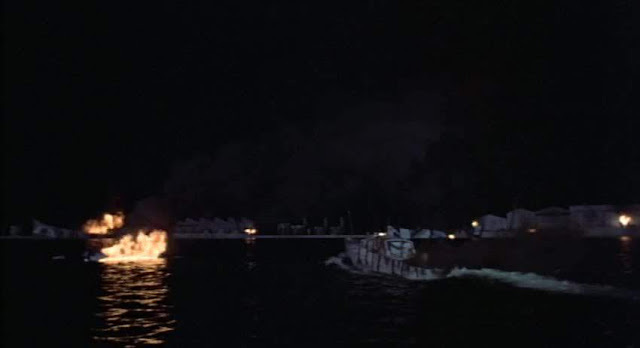 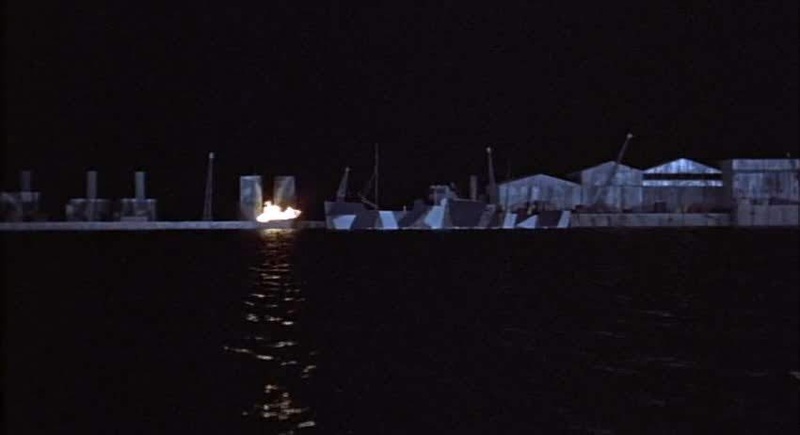 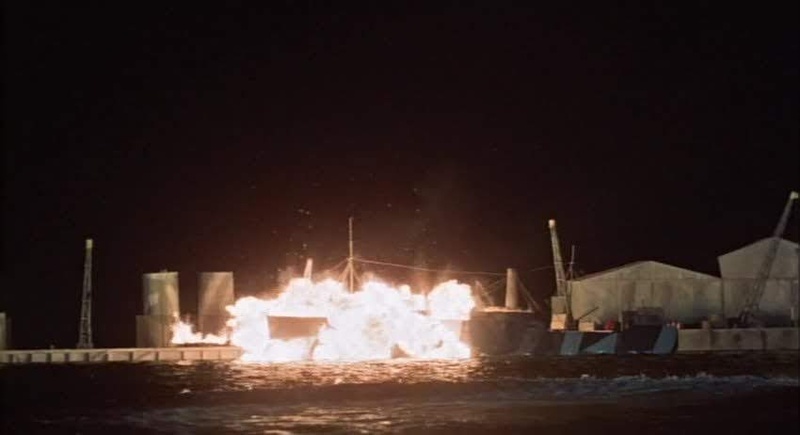 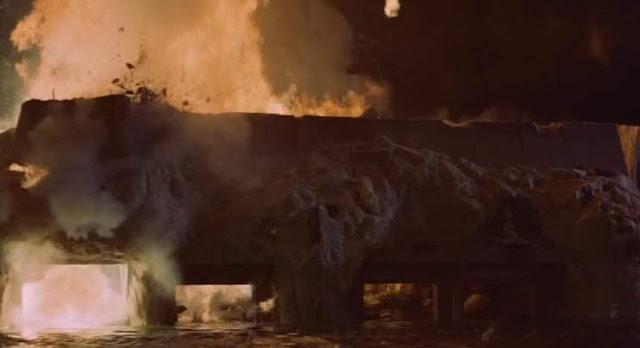 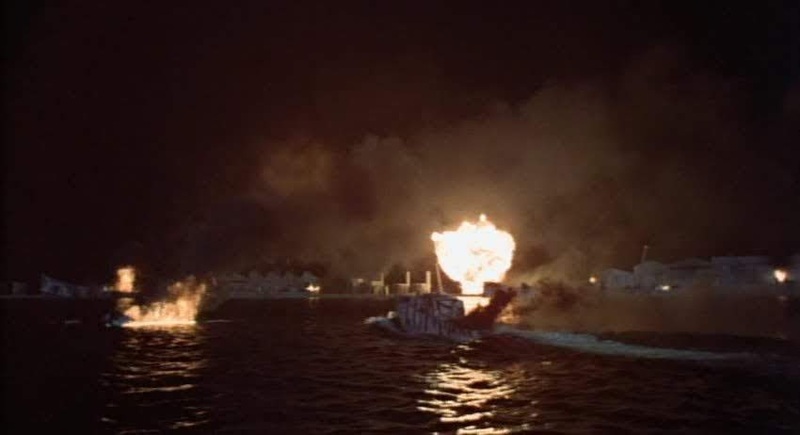 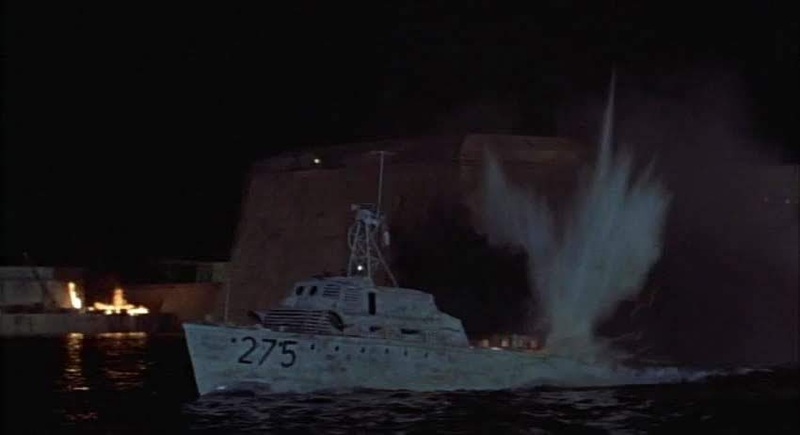 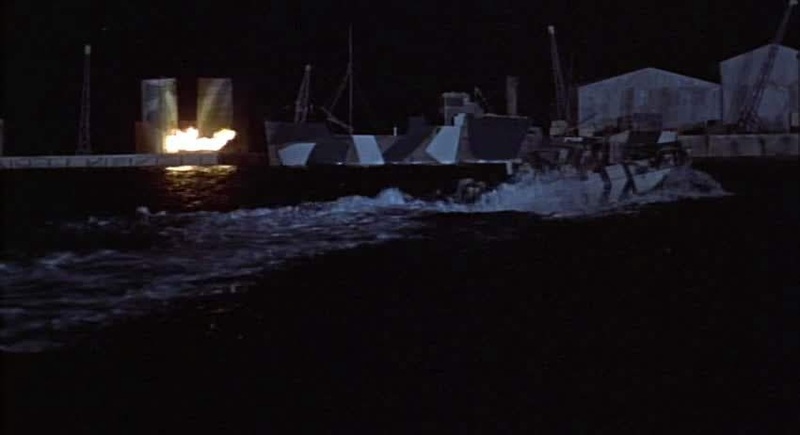 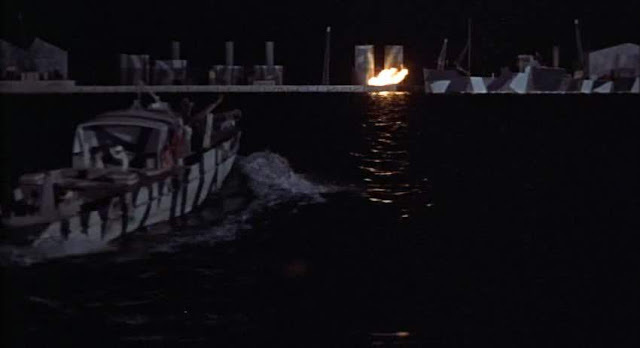 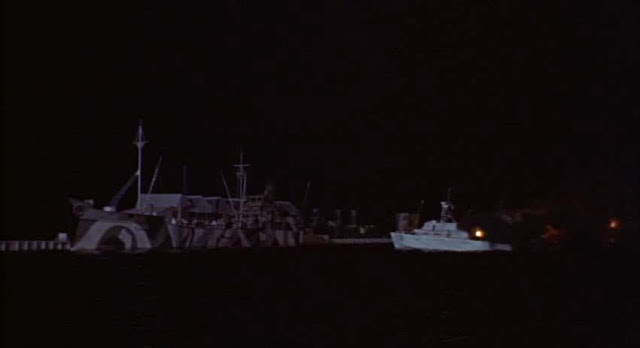 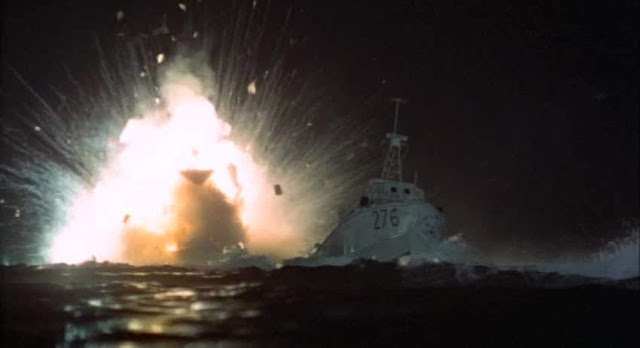 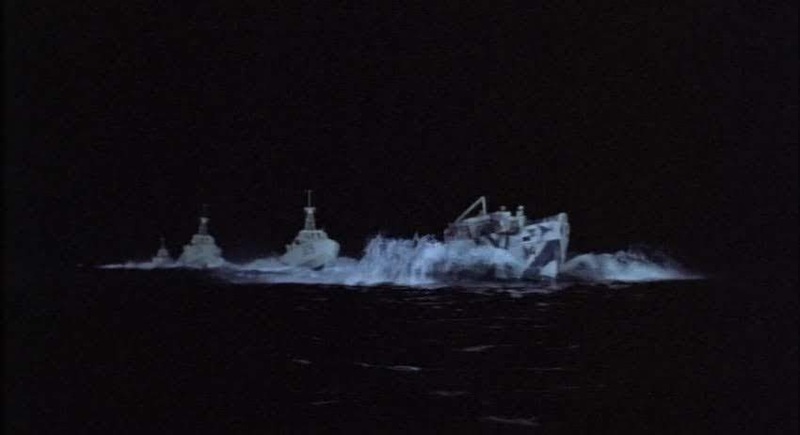 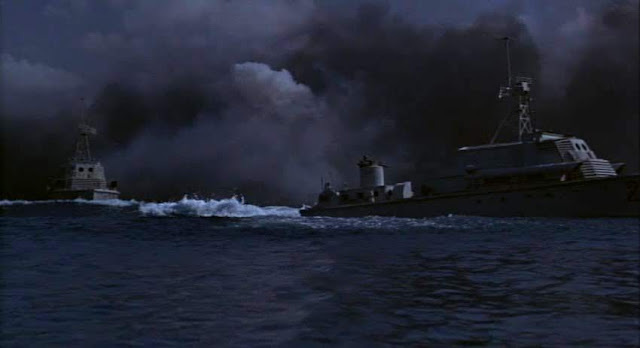 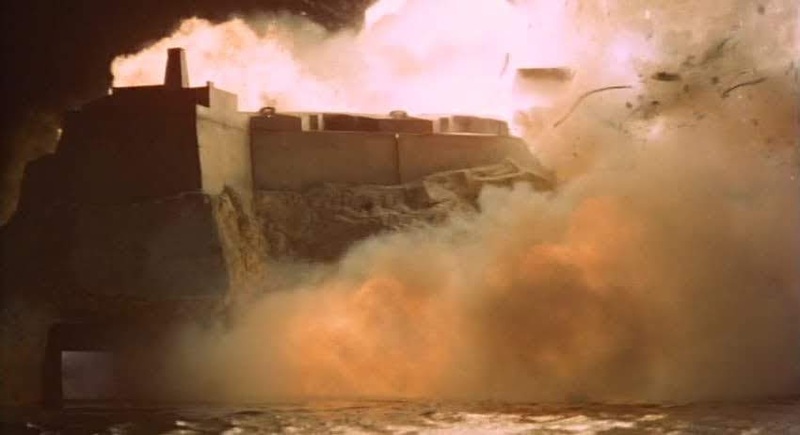 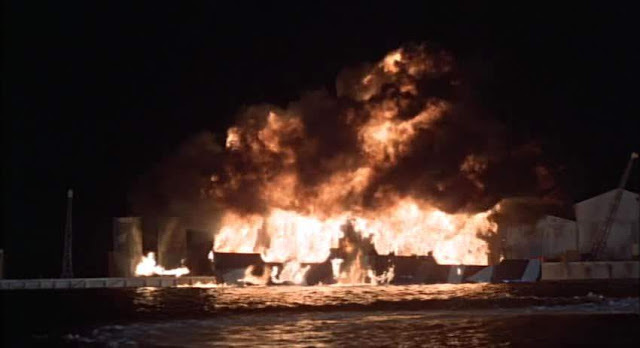 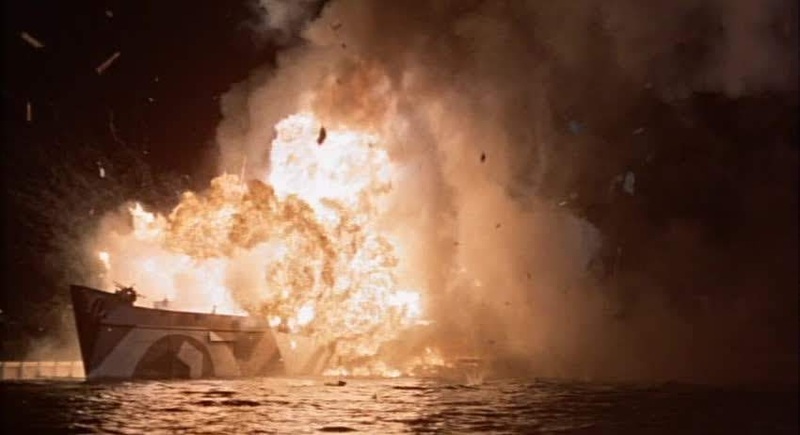 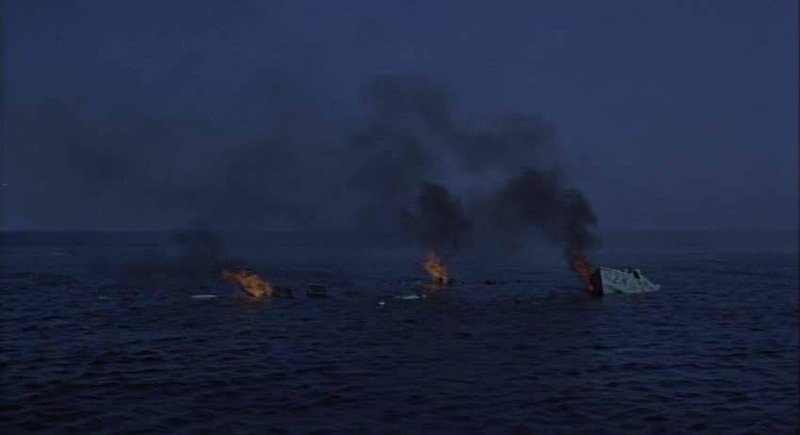 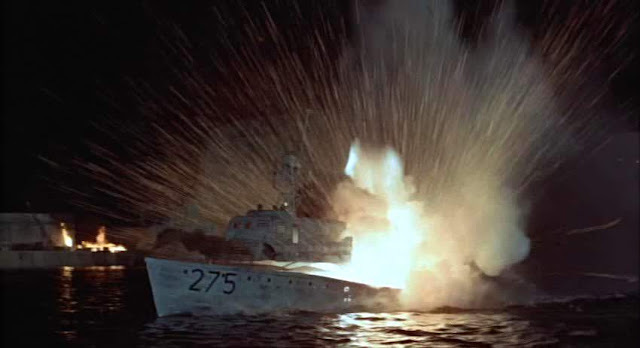 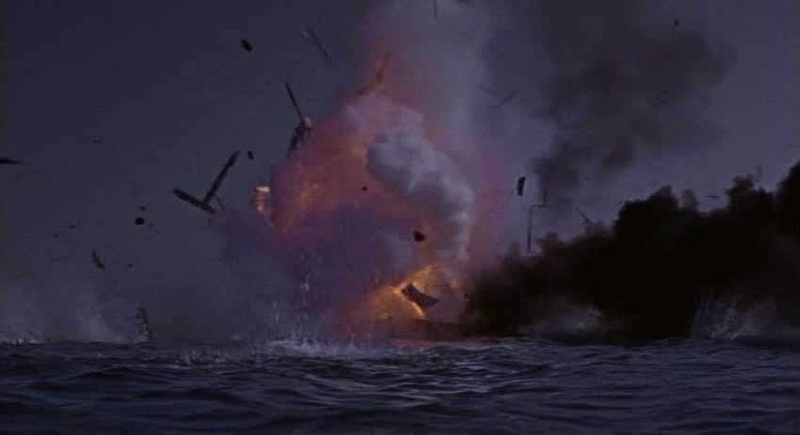 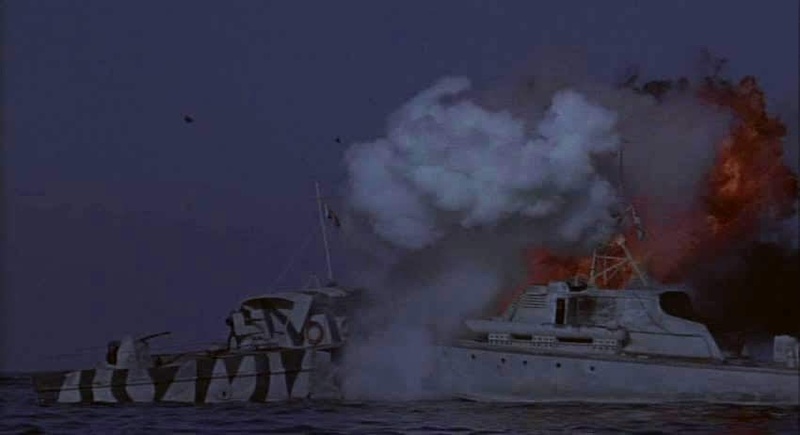 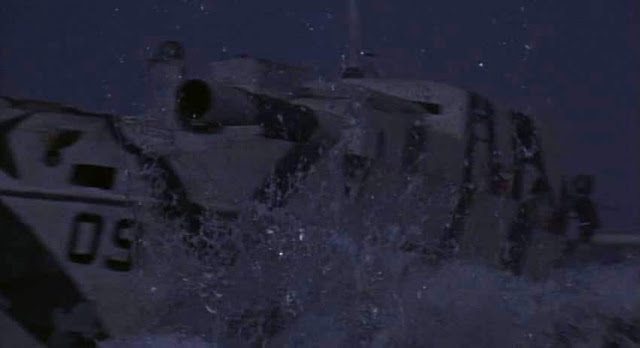 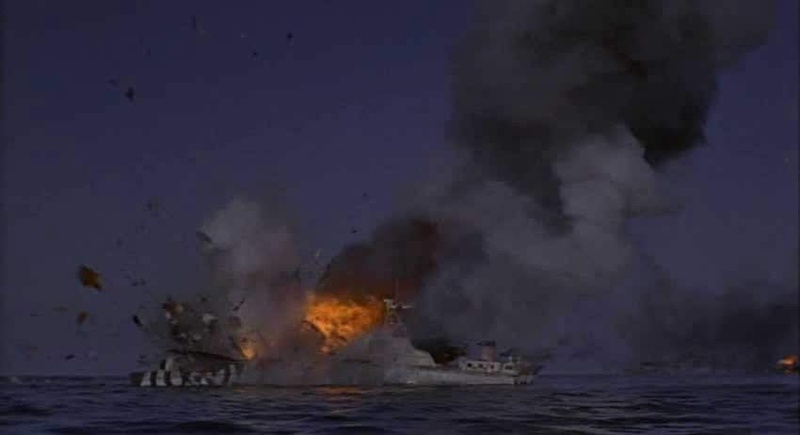 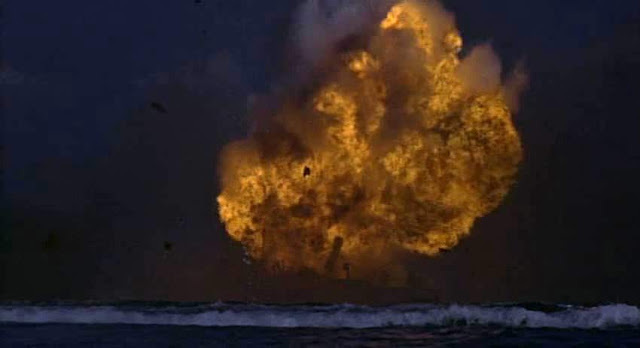 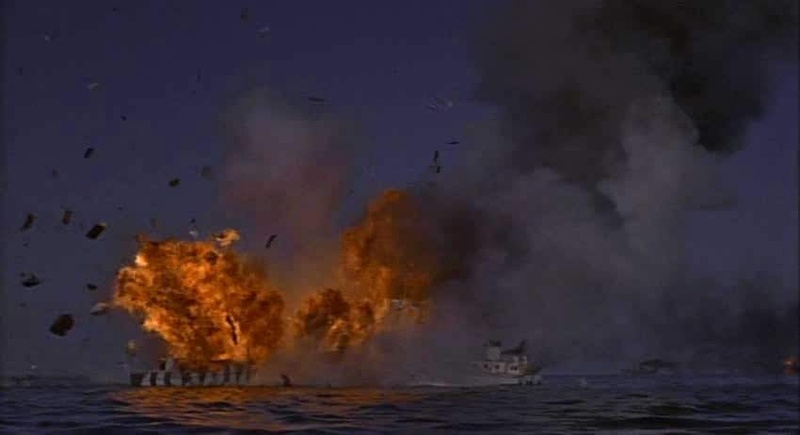 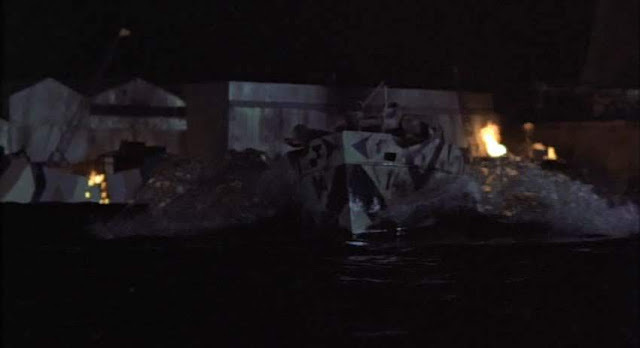 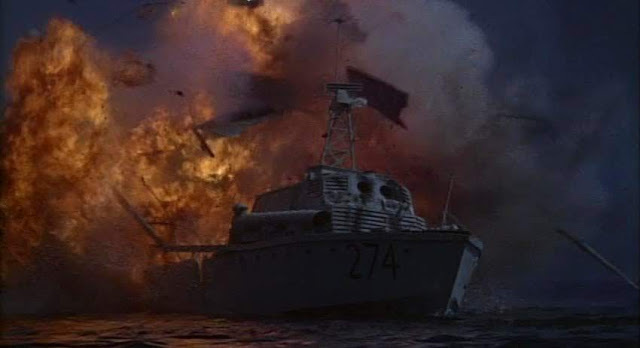 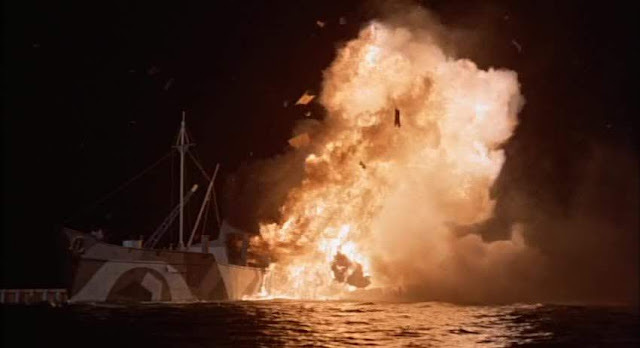 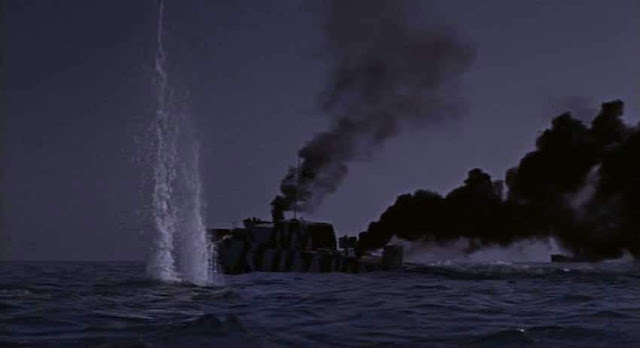 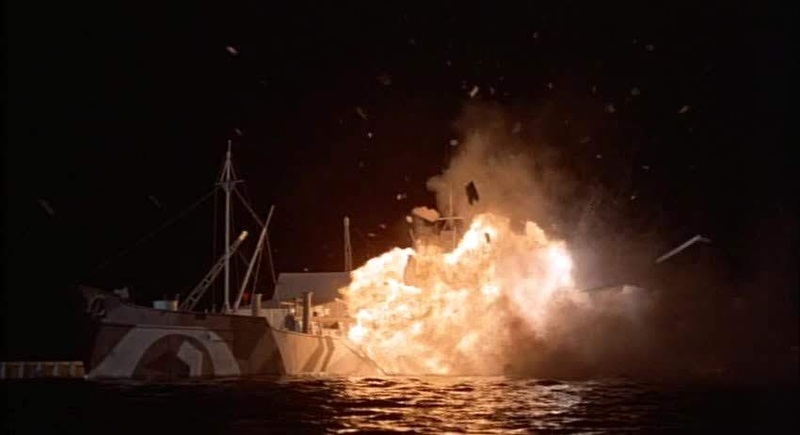 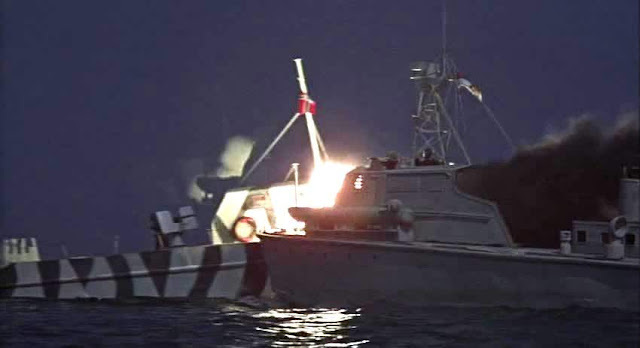 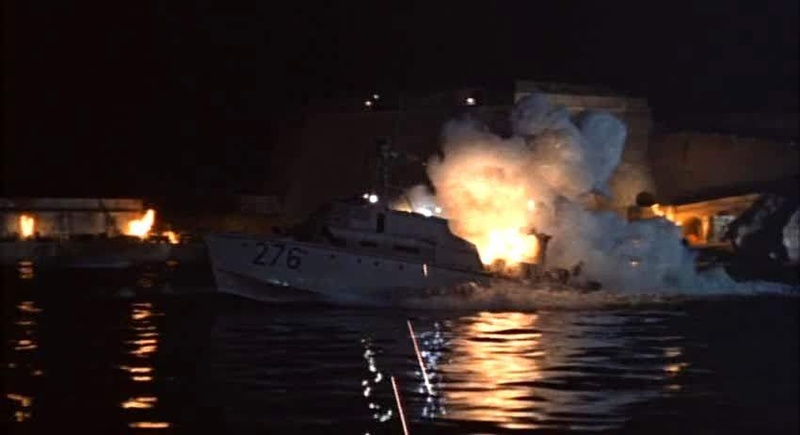 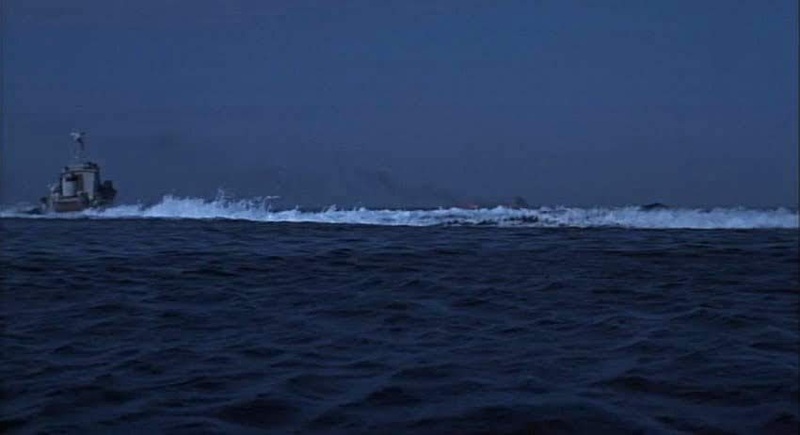 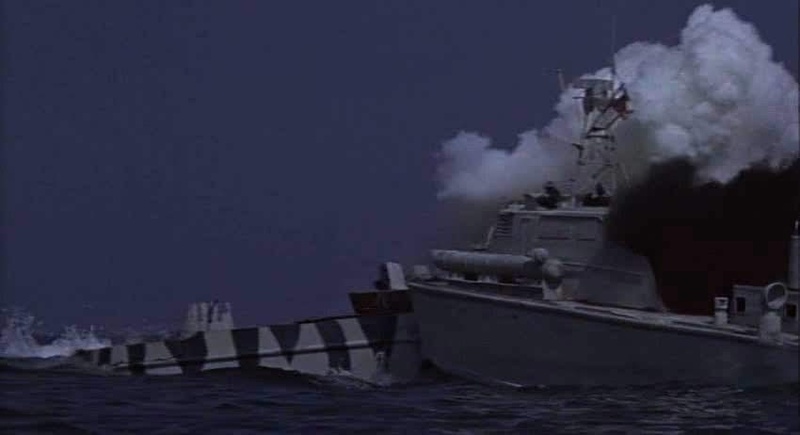 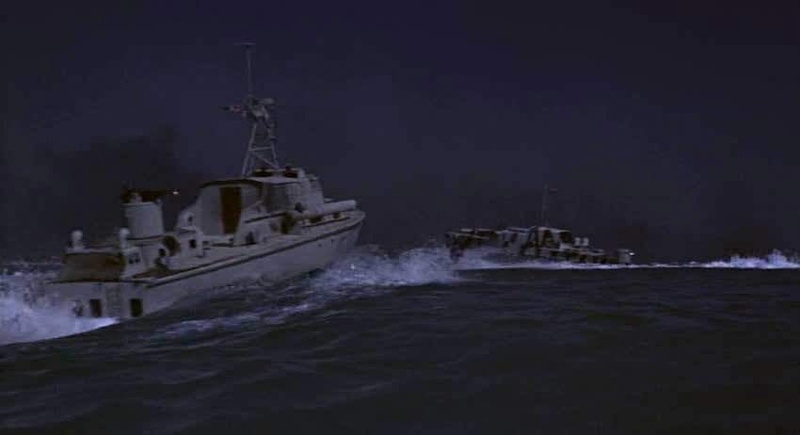 Some of the boat explosions could have done with more scoring on the models so they break up into smaller pieces, they tend to come apart along the line of superstructure and hull and there are a few background ships that look like simple painted cutouts. 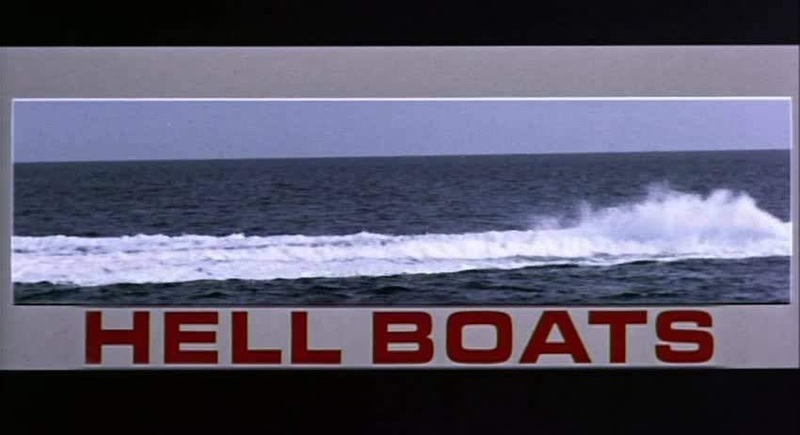 Thanks for turning me on to this film. Never even heard of it! 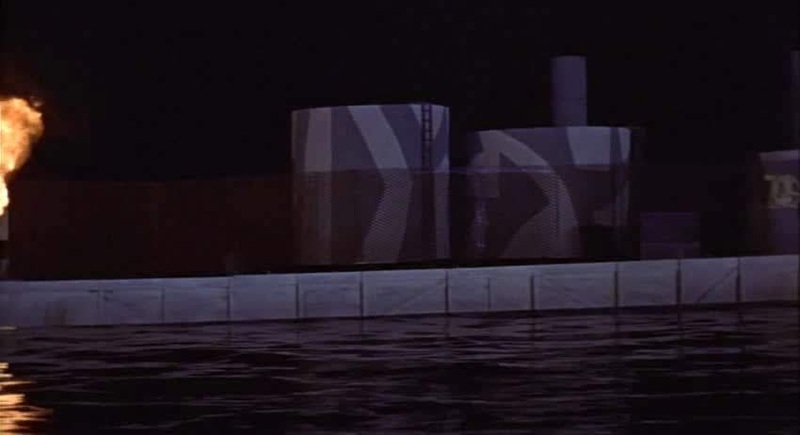 My guess is that this is the work of Les Bowie. 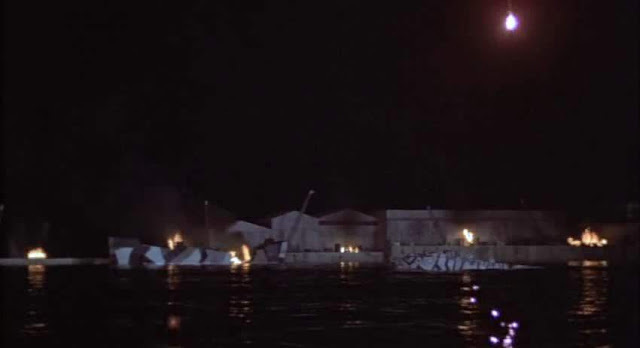 He's credited with spfx on a couple other Oakmont Productions from around the same time like Mosquito Squadron. 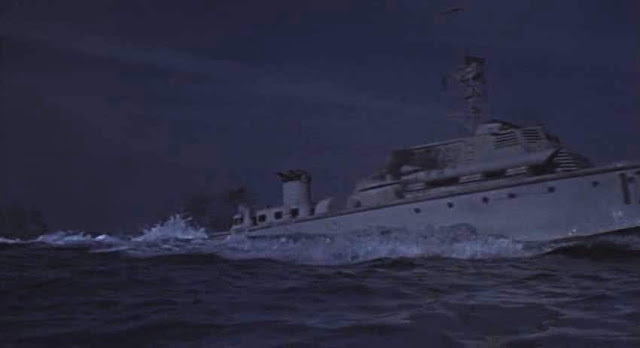 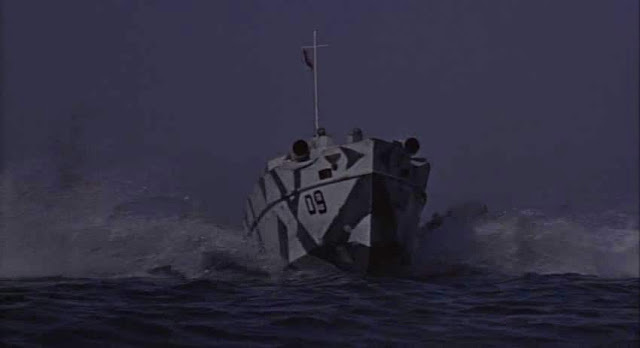 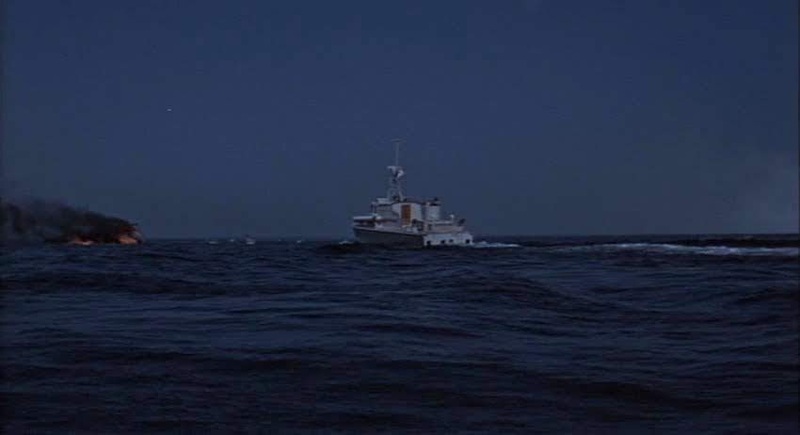 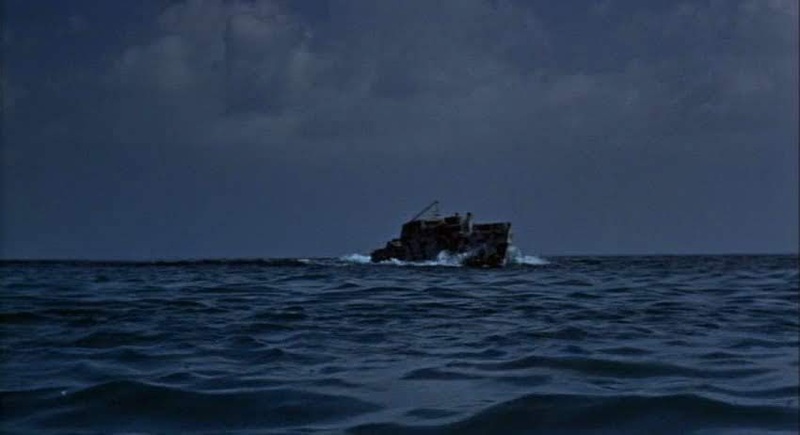 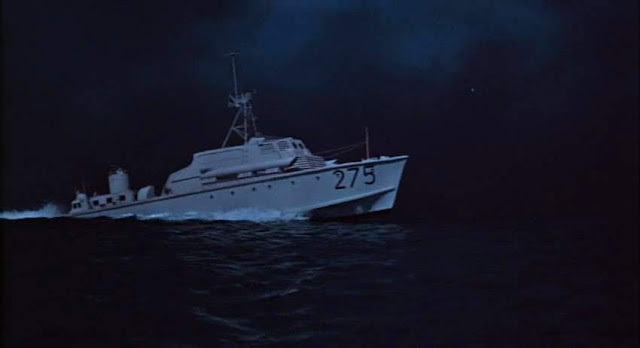 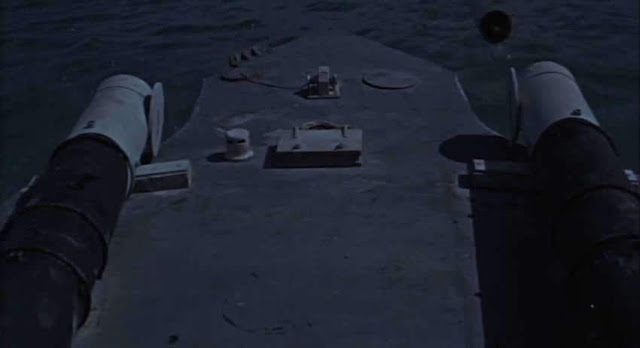 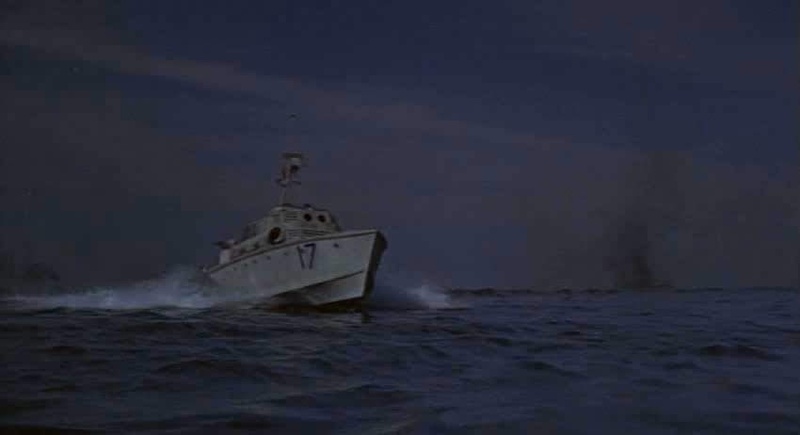 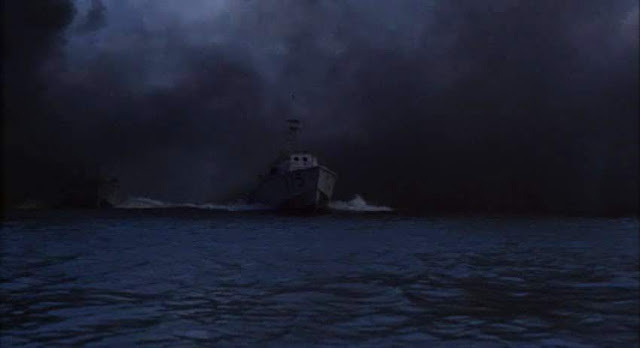 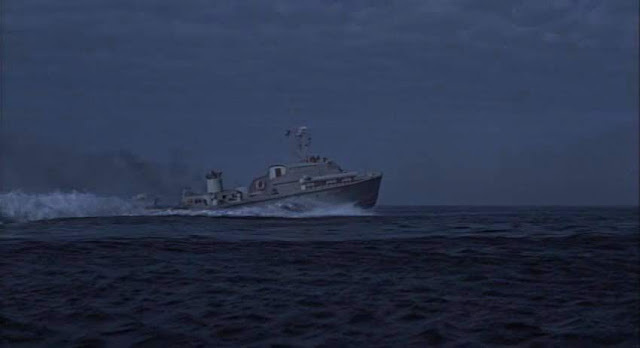 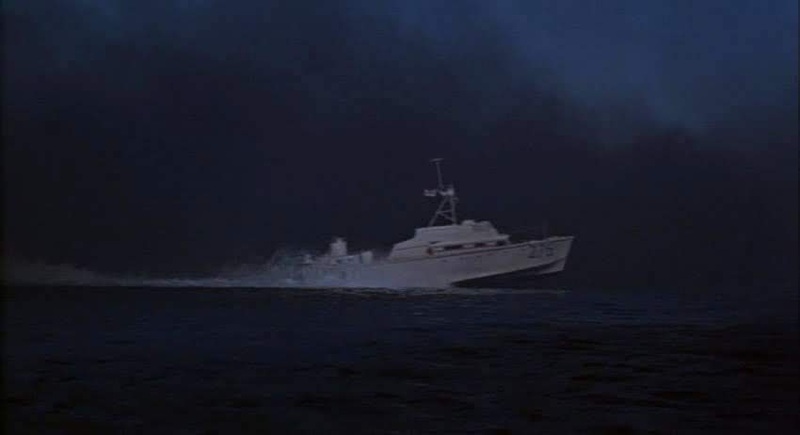 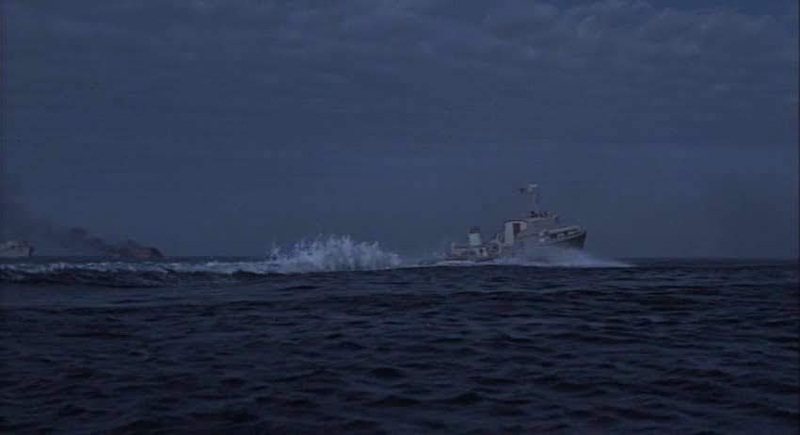 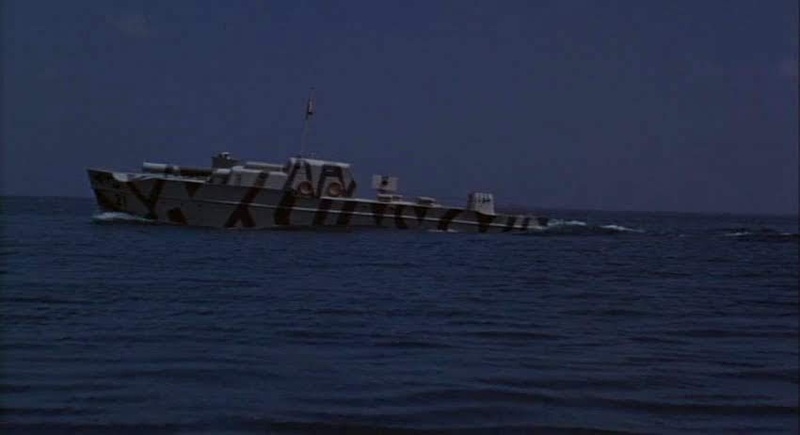 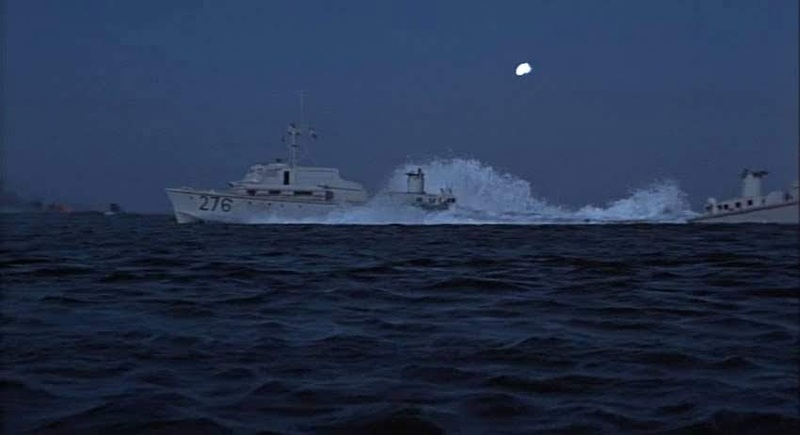 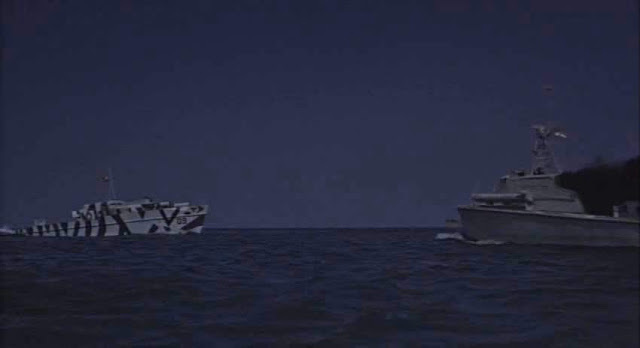 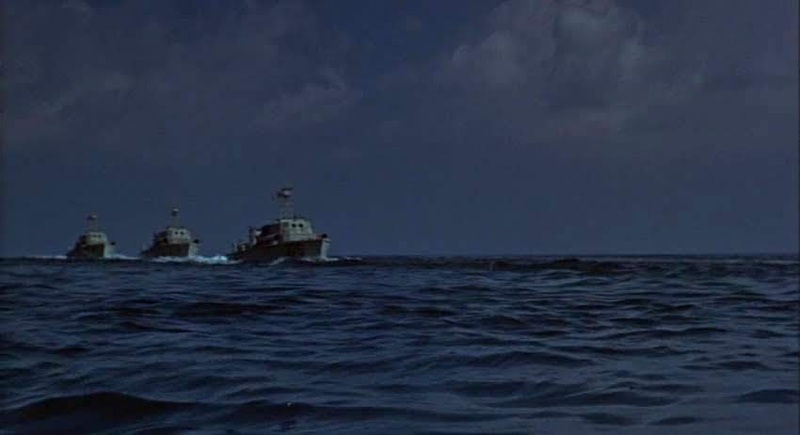 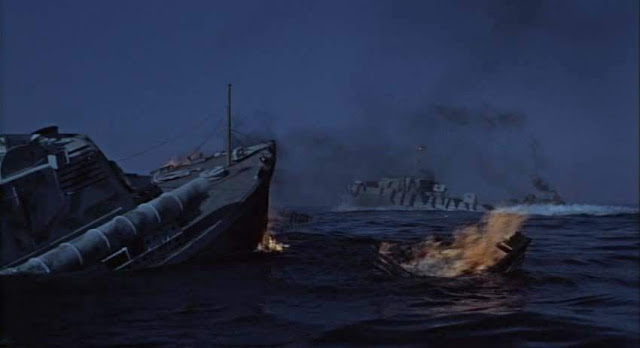 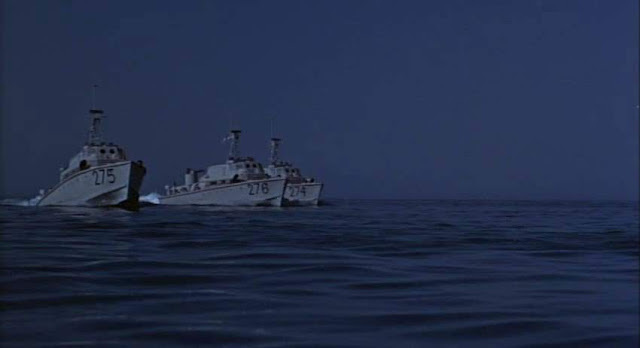 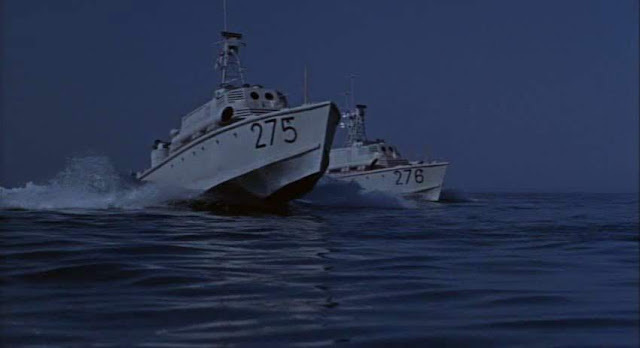 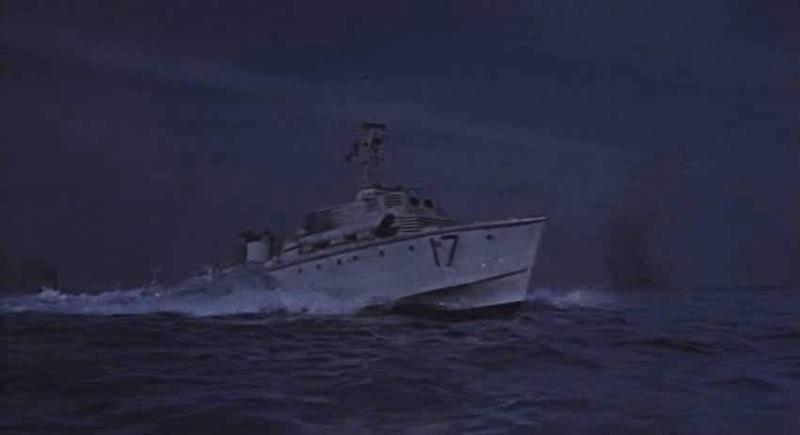 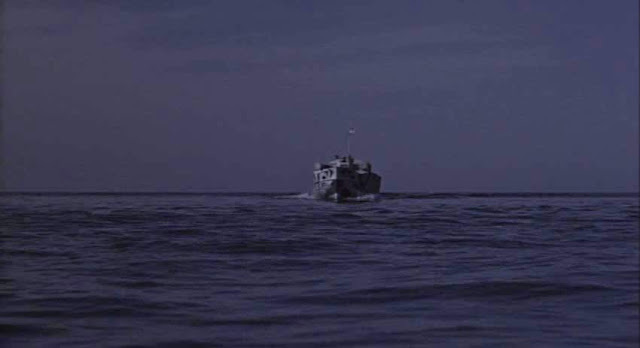 Philip Madoc's gives a performance as an E-boat captain very similar to one he gave the same year as a County Class destroyer captain in an episode of UFO 'Destruction'.